The Art of the Game is proud to present the works of noted sports portrait artist Arthur K. Miller. Mr. Miller's acrylic paintings are exhibited and collected internationally and have been featured in the National Baseball Hall of Fame & Museum. 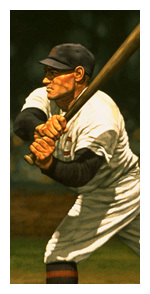 While Mr. Miller's portraits of contemporary sports stars have been widely acclaimed, his full-color paintings of sports heroes of a bygone black & white era are even more striking in their ability to bring to life all the feeling, richness and emotion of America's historical sports memories and legacy. Please sign on to our guest list for a chance to win a copy of Arthur K. Miller's beautiful limited-edition print, "Shoeless Joe Jackson." A $150. value! All paintings are shipped framed unless noted. Prints are shipped unframed. For a limited time only, we are including shipping & handling free of charge with any order! (603) 436-3573 or e-mail us at [email protected]. sports heroes not currently displayed in this gallery. Last updated 10/17/96. -- This site is best viewed with Netscape Navigator 2.0 or higher.